We all have routes we travel often. Here’s one of mine. Bridge Lane. Narrow and accessible only on foot or by bike. Pleasant because of that. Generally taken for granted. It takes you from the footbridge over the Scarborough railway line to Wigginton Road, to the junction where that road and Haxby Road meet. It’s part of a well-used thoroughfare, and an ancient one, centuries old, previously known as Asylum Lane, as mentioned before on these pages. On one side, modern railings, on the boundary of the city’s hospital, which some of us still call ‘the district’ hospital. There’s quite a bit of repainting going on here, of the railings, perhaps connected to some work further along, which we’ll get to in a minute. On the other side, a fine red-brick wall, much more aesthetically pleasing, and much older. Taken for granted, it’s just a wall. But other mellow old walls in other ancient lanes have disappeared, been demolished, making the old lanes less lane-like, with historic boundaries demolished in favour of modern fencing. Cinder Lane behind the station is an example that springs to mind, another is the snicket between Heworth Green and Layerthorpe, where most of the handsome old gasworks wall has been demolished, and the rest of it looks likely to follow. Growing out of the bottom of this fine old wall on Bridge Lane is a developing buddleia forest, undermining it perhaps, with tenacious roots. I noticed these a couple of years ago when they were small, and now wish I’d just pulled them out. But at that particular time I had more important things on my mind, and no spare energy to care. And I suppose I thought the council staff would come along with their weedkilling spray, as they always did. I was never a fan of the indiscriminate weedkilling spray, which killed harmless and often rather beautiful annual wildflowers, but buddleia is a different kind of beast, a tough and resilient shrub. Bit hard to pull it up now. 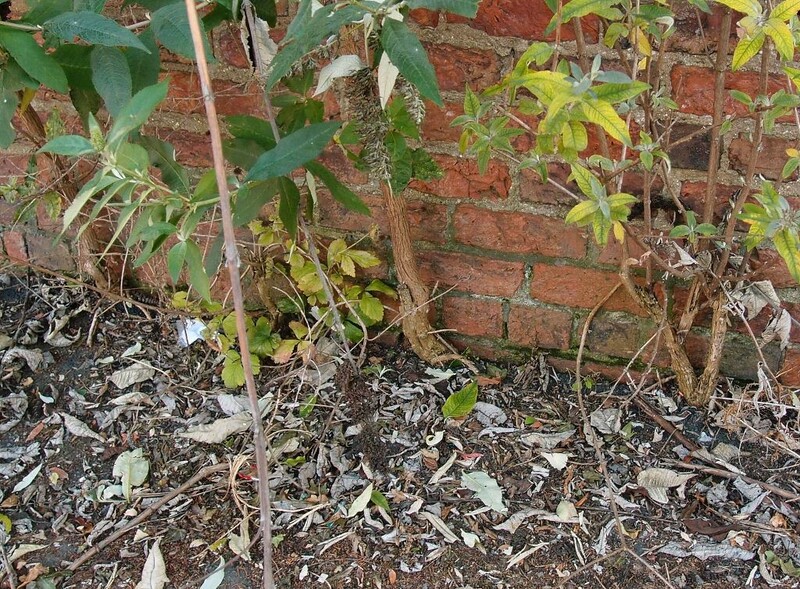 The Bridge Lane buddleias appear to have taken root under the previous administration, which seemed to be more focused on ‘visions’ and big projects, and there were complaints that it forgot about many of the things most of us thought we paid our council tax for. 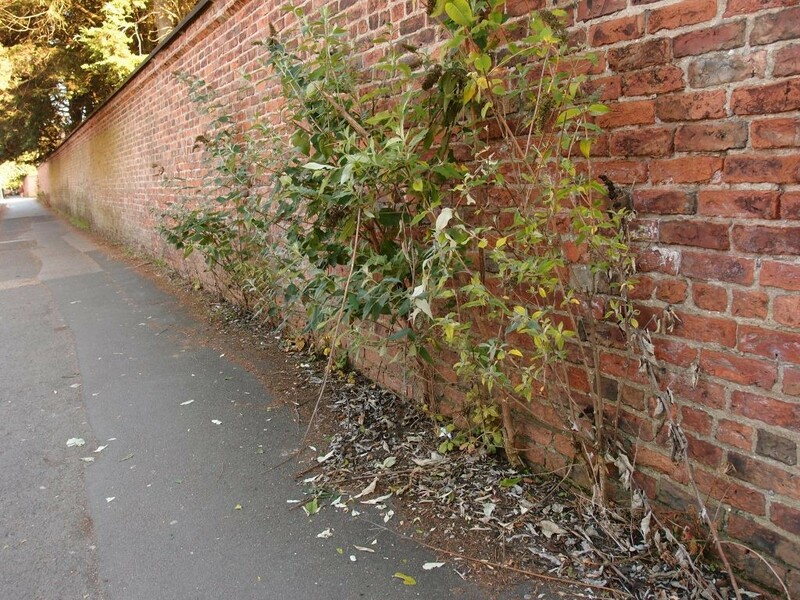 I’m glad that councils in general now tend to have a gentler approach to harmless (beneficial) wildflowers, and don’t go mindlessly mowing down cow parsley, but someone from the appropriate department should perhaps have a look at this wall. Maybe we need a Scrutiny Review Task Group to look at buddleia forests, like the one they had for geese. 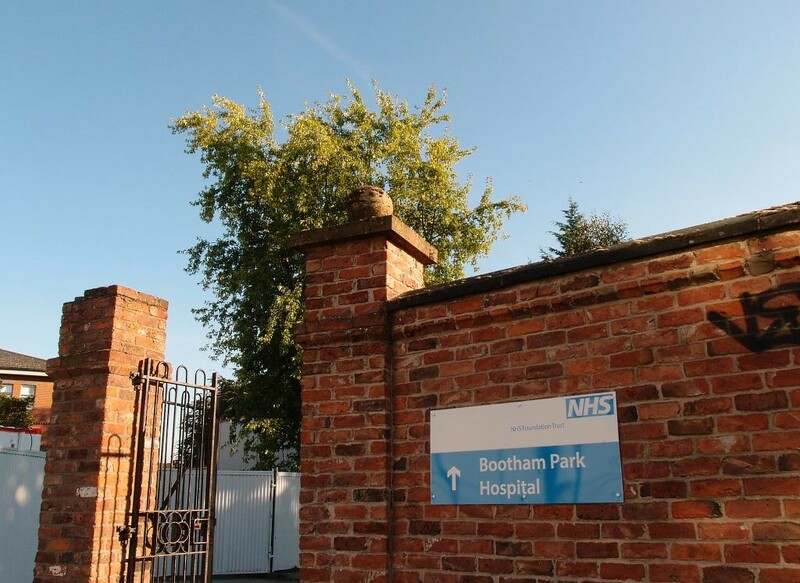 A little further along, interrupting the line of the wall, is a back entrance to our other important hospital, Bootham Park, lined up opposite a side entrance of the ‘district’. I’ve only recently appreciated the stone ball on the top of that gate pillar. The other one seems to be missing. 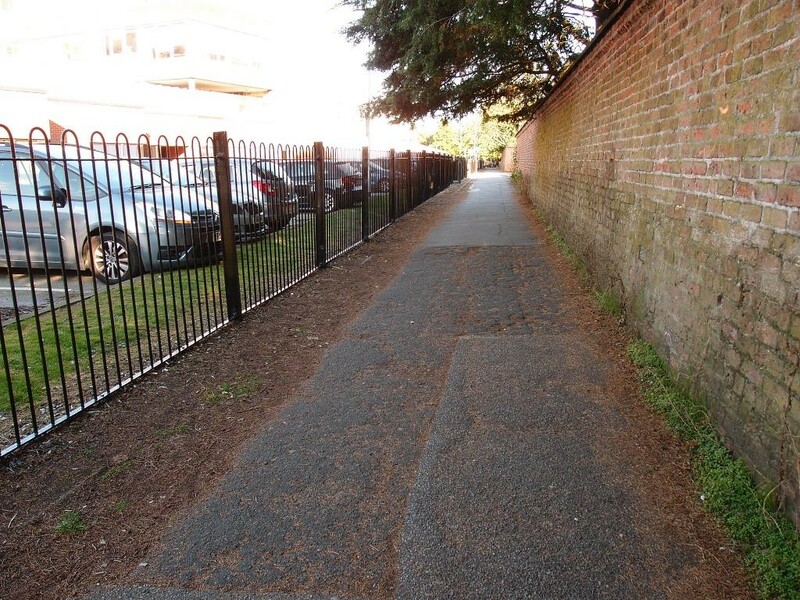 Further along, at another entrance, the words ‘Bootham Park Hospital’ rust and fall off decaying double gates. 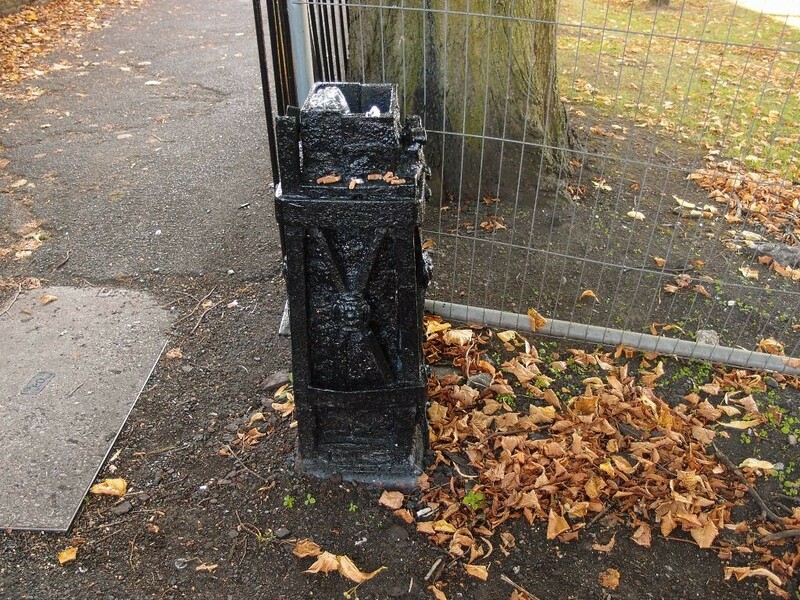 The obvious deterioration in the condition of all the boundaries of Bootham Park should perhaps have alerted us all to the fact that NHS Property Services hadn’t managed to find the resources to maintain this ‘heritage asset’, or make essential repairs and improvements to the interior of the buildings within its boundaries, resulting in the closure of the hospital itself, a year ago. But the railings on the other side of the lane have been painted. Something I imagine no one cared much about. Funny world isn’t it. A load of wasted resources, and people looking in the wrong direction. A bit further along there’s another opening in the wall on the right. As mentioned before, this gives a new and pleasing view across an area that was until recent years covered with buildings, 1970s built, functional. 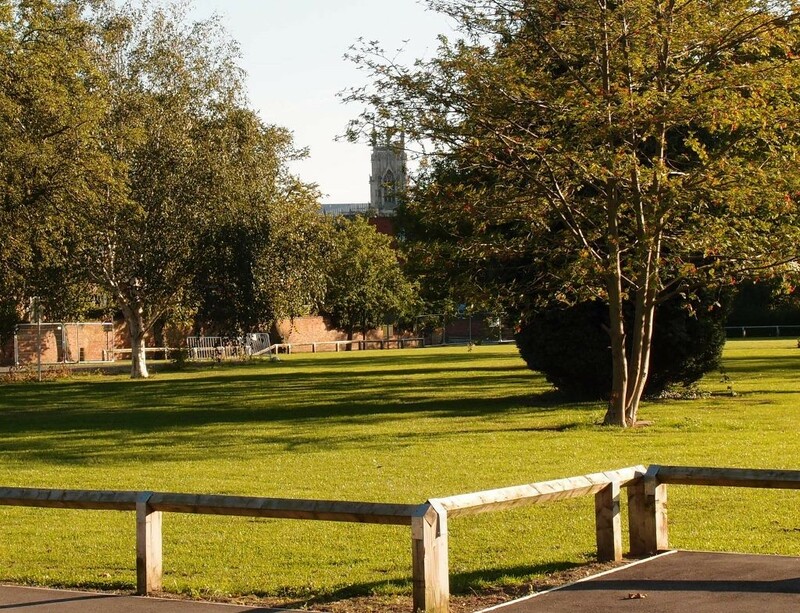 Their clearance and the reseeding of top soil laid here around retained trees provides a green open space and a view of the Minster. Much is made of views of the Minster from the approach roads to the city, and views within the walls are also prized. But out in the suburbs beyond the walls we also love our views of the Minster, and these are often blocked by the development of ‘the brownfield’. 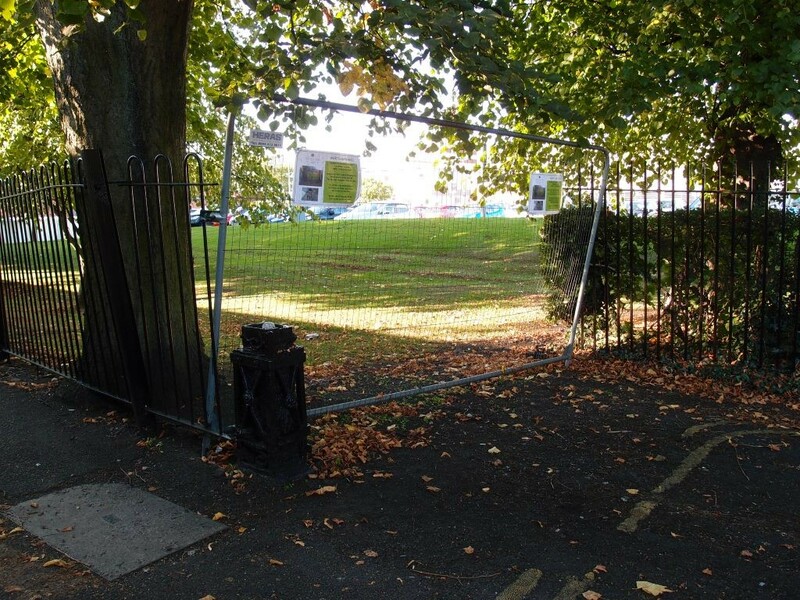 Oh, so much to say … but for now I’d just like to question why there’s a low fence around this lovely piece of green land, which really we should be able to walk across freely, before it’s built on again (inevitable) or blocked from us as part of the likely sale of much of the Bootham Park ‘estate’. 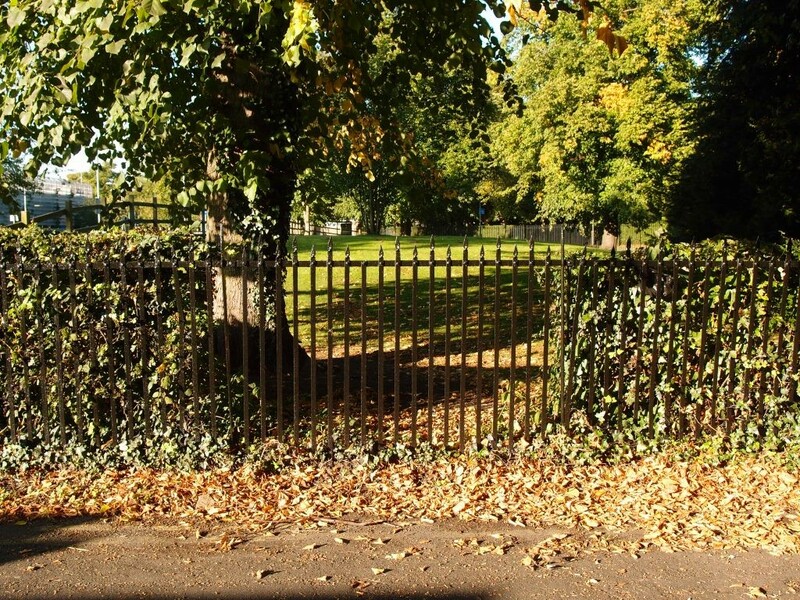 Past that doorway, in the section before Bridge Lane widens out, before old gates we’re about to reach, I once saw a sparrowhawk on the grass of the hospital grounds just inside the railings. Two men, drinking cans of lager, were sitting in the lane with their backs to the wall, watching it, with rapt attention. Their gaze brought the bird to my attention, as it feasted on a pigeon, apparently oblivious to passers-by and the focused gaze of the seated audience. A little further along, Bridge Lane widens, and to the left is a gateway, once leading on to this piece of land. It has featured on these pages before. Some months back the gates disappeared. 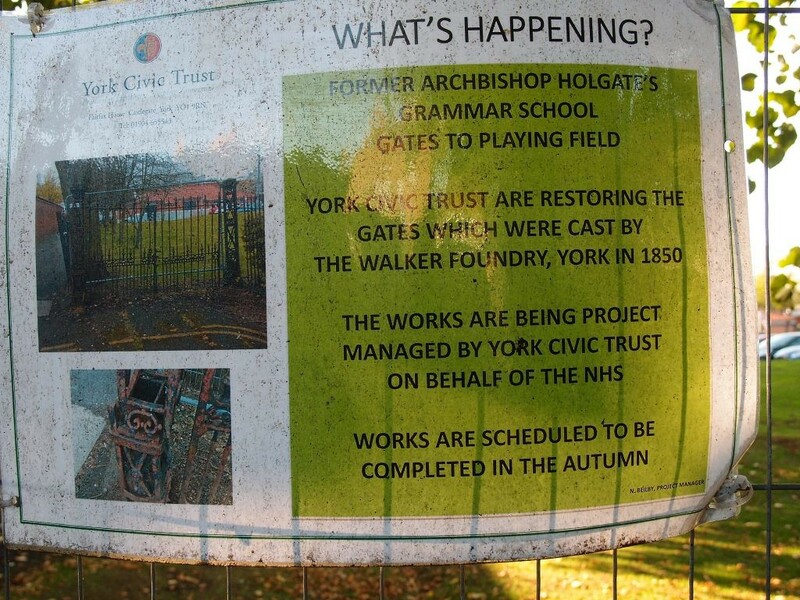 A sign explains that the gates and posts are being restored by York Civic Trust, in partnership with the NHS Trust, and work should be completed soon. Then, just past that, more repainting of the Bridge Lane railings, which have several styles. Towards the end of the lane there’s a hedge growing through the railings. 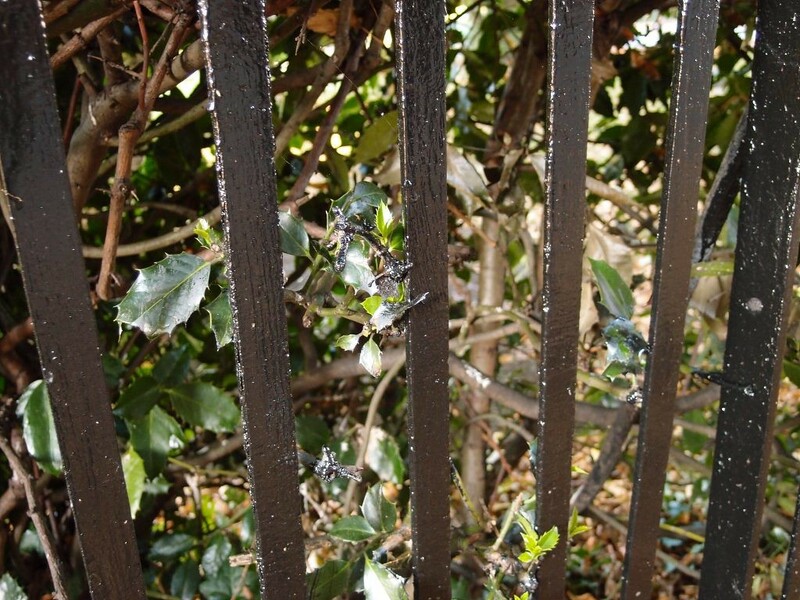 The painters of the railings have also painted bits of hedge. As all property owners are no doubt aware, it’s important to repaint regularly to provide protection against the elements. Now the work’s been done that holly shouldn’t need repainting for a good few years. Then we get to the end of Bridge Lane, ready to turn right onto the busy road and head into town. Turning right we’re greeted by another bit of repainting, this time a purplish shade, rather unsympathetic and jarring against the red brick. The side gate of Groves Chapel. A short journey of around 300 metres, down Bridge Lane. A page of around 1000 words. A route I’ve walked often over the course of 20 years, heading into town, knowing that it was a well-worn route for centuries before that. It will stay a right of way, cutting its course through, while all changes around it. Railings repainted and historic walls neglected, buildings demolished and others constructed or extended, hospitals underfunded, and probably one of them sold off and turned into a hotel. Just a short walk, but always so much to think about, just walking from A to B. As a teenager in the late nineteen sixties, I would regularly walk from my home in St Olaves Road Clifton, to my Grandmother’s who lived in Stanley Street Haxby Road. It was only a fifteen minutes walk over the footbridge, and along Asylum Lane. This was the name my Mother and Grandmother always used, although at this time it was named Bridge Lane. At this time there was a mature hedge on the opposite side of the lane to the wall, and beyond this a large expanse of grassland where the hospital now stands. I used to play football there with friends, and also remember York City would use it for training. 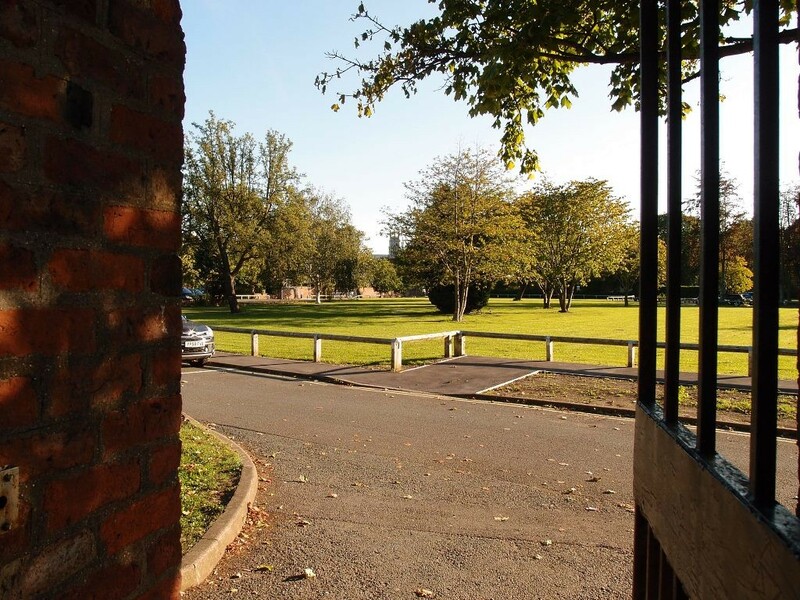 I also remember watching a school rugby game adjacent to Wiggington Road between my school Lowfields, and Park Grove, who used the area as playing fields. There was a rudimentary changing hut next to the ornate gates mentioned in your article. I seem to remember it was oval in shape, and built of Asbestos sheets, rather like the garages of the forties and fifties. Adjacent to the rear entrance to Bootham Park there was a lovely Victorian / Edwardian villa type house, probably once belonging to the Bootham Park groundkeeper. Unfortunately this was demolished when the entrance was widened and the Nurses Accomodation built in the mid seventies, ironically now also demolished ! Painting the holly could be a new Christmas custom. 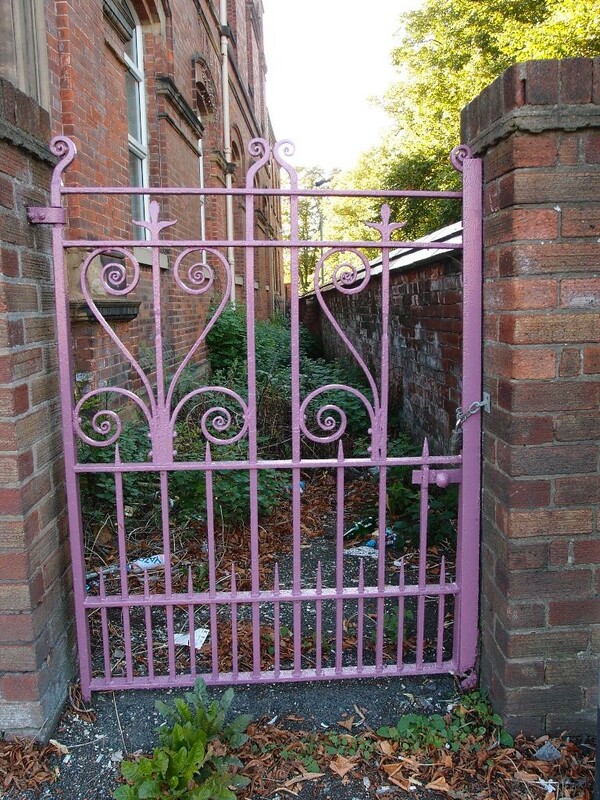 I love the 1960s/70s gates with the name of Bootham Park Hospital on, such a shame they are also deteriorating.